HEY EVERYONE did you hear that I'm still alive somehow!? I have a new book! You can get it! Books and Cons oh my! Welcome to the Real World is HERE! Writing Comics and other 2012 Events! Hey everyone, I hope you had a great holiday! A new calendar year means getting 2011 things sorted and gearing up for 2012 events, and I'm excited to announce the first few of them! 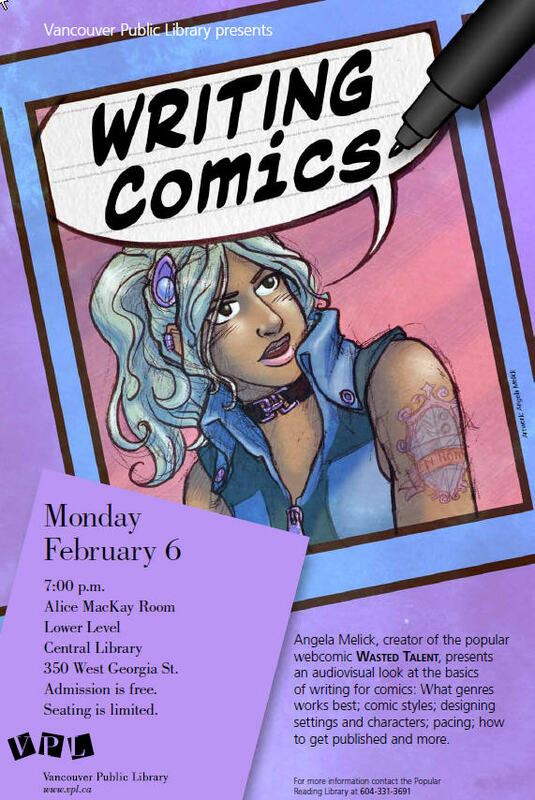 First I'm doing a free lecture on Writing for Comics at the Vancouver Public Library! You should come it will be awesome. Hey Toronto & GTA/Ontario/East Coast Canada! I'm tremendously excited to announce that I will be boarding a plane later this week to visit you! That's right, I'm heading South March 4-6th for one of the three shows I'm doing this year: Emerald City Comiccon!. I'll have books, and prints and buttons and smiles and you should definitely stop by to say hi! Hey everyone, I'm finally able to tell you a bit more about my convention schedule for 2011! This is my convention report for Stumptown 2010!! Hopefully the video thing will be easier in the future, I had to re-teach myself a bunch of stuff today, heh. AT LEAST It’S DONE. I think I missed one or two “fun”s. The Fourth and Best Ever Anthology by the Cloudscape Comics Collective is finally here! Exploded View is a 200+ page collection of Science Fiction comics and there are some really stellar stories in here. Twenty Five artists from British Columbia including Camilla D'Errico, John Christmas, Jordyn Bochon, Coleen MacIsaac, Jonathon Dalton, Jeff Ellis and Yours Truly!